Today was the final day’s flying of the 2015 season; we had hoped to fly at least one more trip but the weather intervened earlier in the week and the option of flying on the 15th was removed when the government announced that the Al Hijri New Year holiday would be on the Thursday, giving the Jordanians a long week-end. 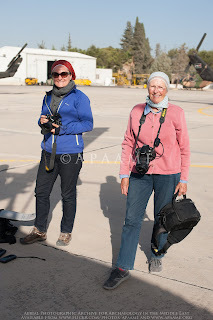 Rebecca Banks and Jane Taylor getting ready for our last flight. However there was a highlight, in that we were joined by Jane Taylor, author of the High Above Jordan and renowned photographer. It was Jane’s work which gave David Kennedy the inspiration to attempt to start an archaeological flying campaign; she blazed the trail which opened up access to the Royal Jordanian Air Force and she has been a great friend ever since, and supporter of our work. The excavated site of Al-Kanisah Monastery west of Madaba. 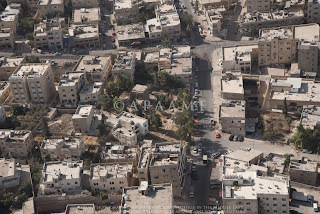 The plan for the day was the greater Amman area, initially heading south for reconnaissance in the Madaba area – such old favourites as Rumeil, still looking in good condition but the terracing along its slopes becoming much more pronounced since we first photographed it in 1998 (see Ancient Jordan from the Air, pages 106-7). 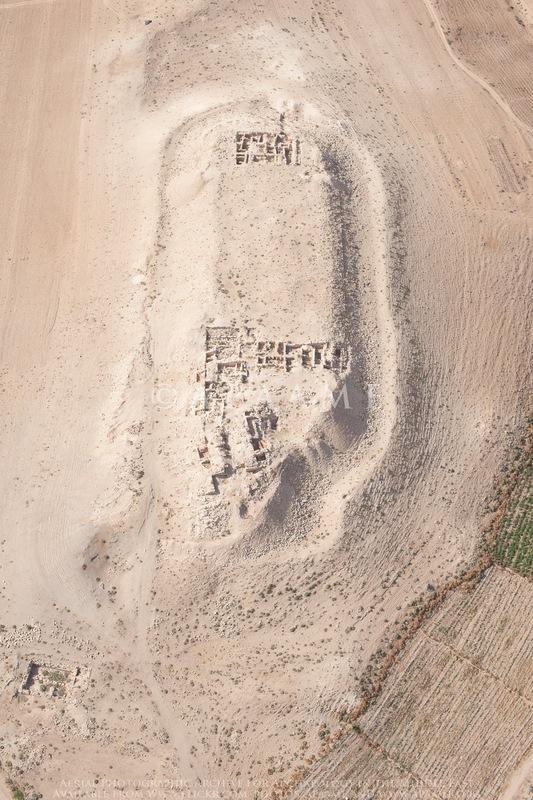 Then on to Khirbat al-Mudayna, in the Wadi ath-Thamad, a substantial, defended hilltop enclosure, much changed since we were there in 1998 (ibid:112-113). It is an Early Iron age site, with its defences being started in the 9th century BC. The excavations have revealed the first ever excavation of a Moabite temple, and complexity of buildings which could only have been guessed at from its seemingly smooth surface. 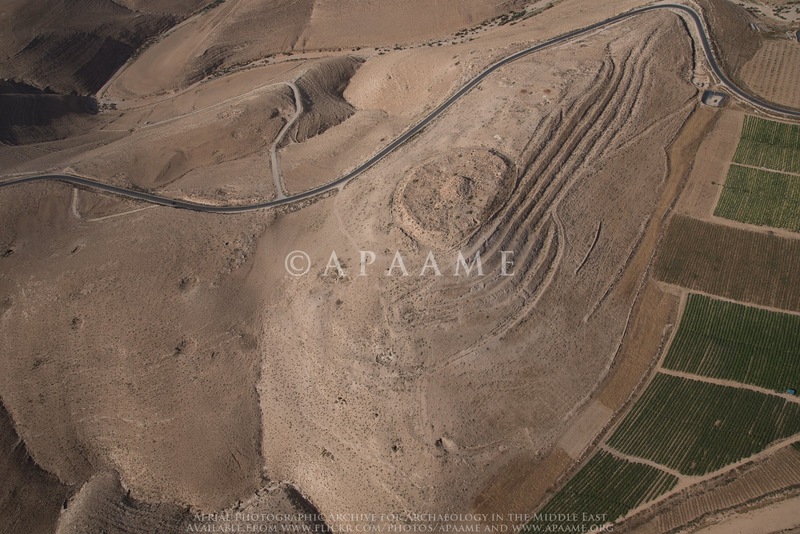 It may have been the site of Jahaz, the place name in the Bible of the battle between Sihon of Heshbon and the Israelites (Numbers 21, 21-4). The excavations at Khirbet al-Mudayna. 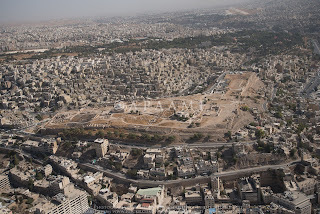 We returned north to the now metropolitan landscape and were spoilt to a fly past the citadel of ancient Amman, a rare treat as air traffic is so restricted in the city centre. We refuelled at Marka and said our farewells to Jane, who we hope to see again in the skies above Jordan next year. 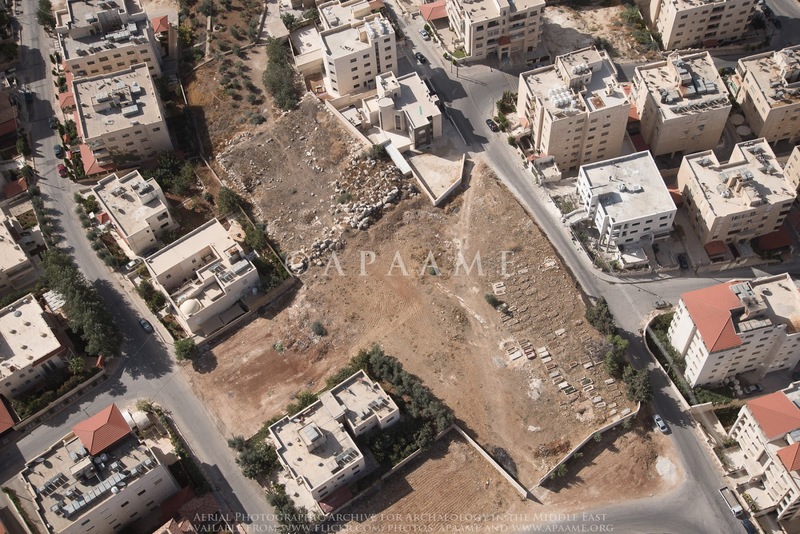 Quweismeh Tomb hidden amongst the modern urban fabric of Amman. We returned to the air, this time just the two of us (Becc and Bob), to an intense 90 minutes of photography of targets, often crammed between roads, houses or hidden in trees. 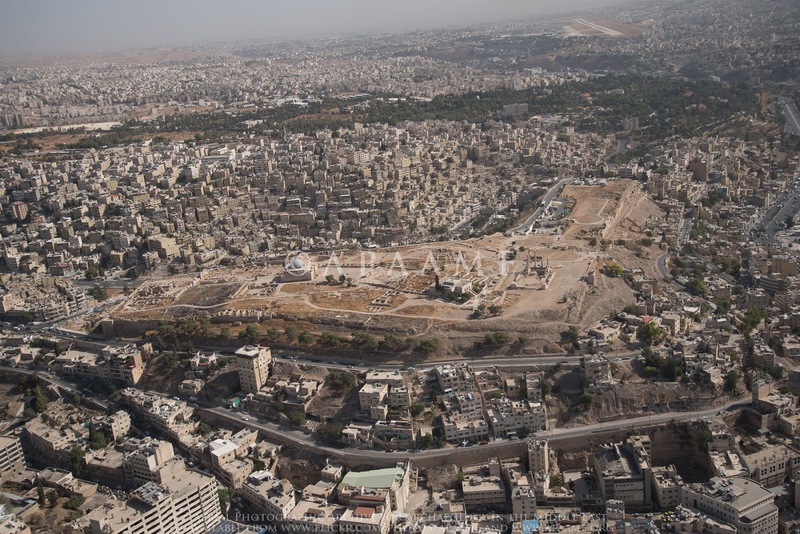 This may be the last chance to photograph some of these sites as the pressure for building land intensifies in Amman. 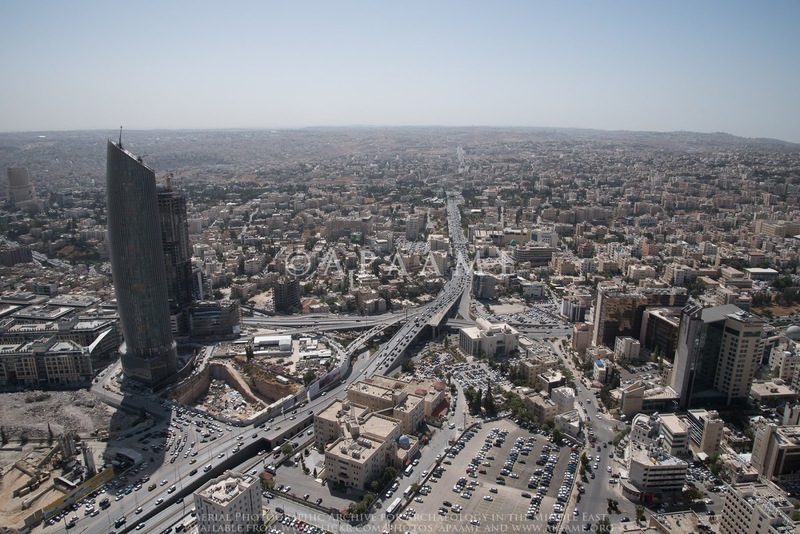 The influx of refugees and others seeking work has made this city one of the fastest growing places in the Middle East. Qasr Khilda, now sandwiched between urban apartment buildings. 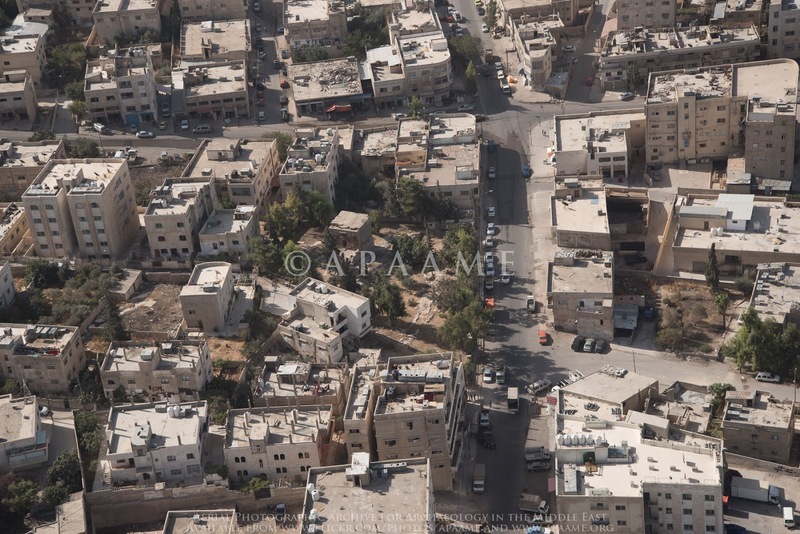 Flying and photographing over cities is the most challenging of all aerial photographic missions; communication between pilot and photographer is key, as the targets are both difficult to spot and are so close together. Add to the mix the noise from “air traffic control” from the airport; continuously managing other traffic and then telling us that we can’t stay there and have to move away. Safety first, thankfully, given the proximity of some large buildings; at one point I was asking the pilot to orbit right – as I was looking out of the side of the helicopter; he replied “but doctor there is a large building in the way....” He is in charge so we went round the building. 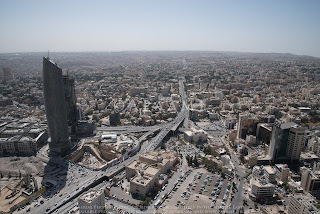 "but doctor there is a large building in the way..." - photographing in Amman. As this was our last flight of the season it is right to commend and thank all the pilots and staff of the RJAF for their professionalism and skill in taking us on these archaeological hunts, and bringing us back safely. 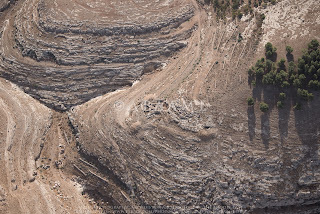 We have covered the length and breadth of the country in almost 30 hours flying, and photographed many sites which we have not been seen before; sites under great threat and others which we hope will remain untouched for a long time to come.